If I were going to simply wear it around my neck for what might ail me I’d buy the tasteless imports from China that currently bulge the bins of my local supermarket. But for cooking with the stuff I head to Antonio Cléroux’s stand in the Parkdale Market. There, I buy a braid of the ‘’Gourmet Red,’ a varietal of the ‘Purple Stripe’ of Hardneck garlic from Antonio’s daughter-in-law Marie, a member of this genial family of growers from Navan. This is garlic season. 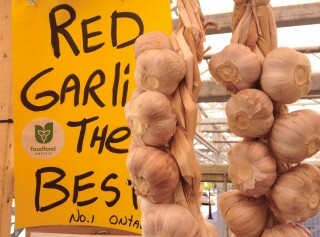 And though it’s been brutal growing for many things, garlic has been sitting pretty and parched. It likes a good dry spell a few weeks before harvest and a dry spell it surely did get. Garlic is a member of the lily family and as your grandmother must have told you, “lilies don’t like wet feet.” So there’s a bumper crop out there.